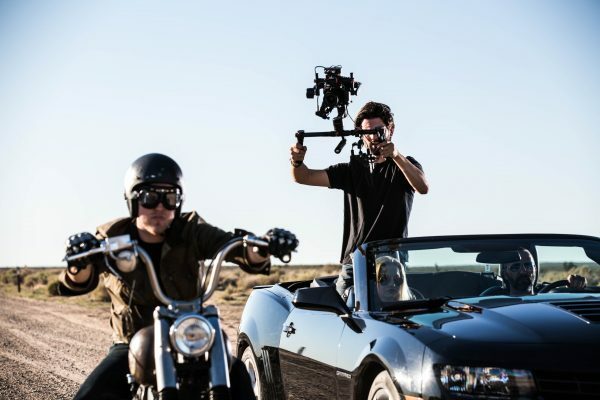 Ahead of the start of the NAB show in Las Vegas tomorrow DJI have launched their new Ronin M brushless gimbal. 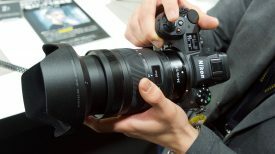 Designed for lighter cameras up to a stripped down C300, it is smaller and lighter than the original Ronin. 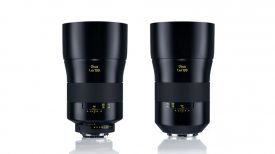 The new gimbal is made of magnesium alloy which reduces the weight while maintaining strength. The gimbal has most of the features of the original Ronin and a few new ones. Check out the video above to find out more. DJI were tight lipped about the price of the gimbal, but did say it would be below $2000 US. It should be available to pre-order by the end of this month. 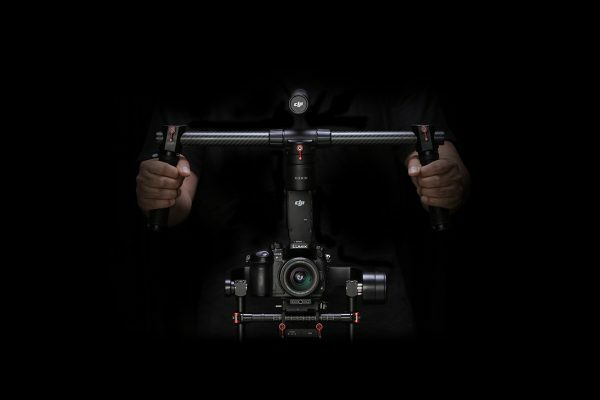 Las Vegas, April 13, 2015 – DJI, the world leader in creative camera robotics, today announced the DJI Ronin-M, a lightweight handheld camera stabilizer that can carry camera set ups up to 8 lbs (3.6 kgs). The DJI Ronin-M opens up possibilities for camera movements like never before with its unique, lightweight (5 lbs / 2.3 kgs), magnesium frame. Camera operators will be able to take the DJI Ronin-M wherever they go with its easy to twist-off top bars, which helps minimize travel size. 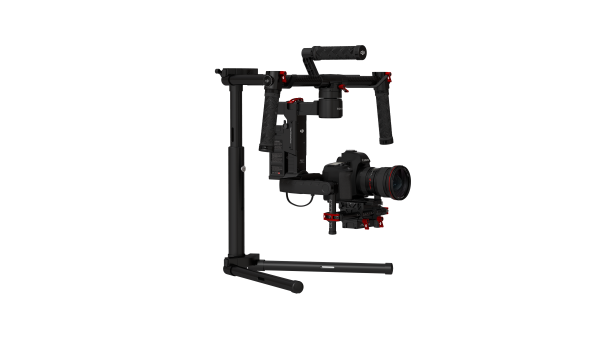 Based on one of the world’s most popular handheld camera stabilization platforms, the DJI Ronin, and DJI’s market-leading ZenMuse gimbal technology, the DJI Ronin-M carries on DJI’s focus on making camera platforms easy to setup and operate. 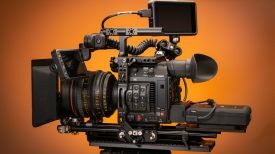 Within 5 minutes, operators can easily balance cameras ranging from Micro Four Thirds cameras to RED Epics. The DJI Ronin-M incorporates the same easy-to-use, high performance technology as the DJI Ronin. Driven by SmoothTrack technology, the DJI Ronin-M allows single operators to effortlessly track action while maintaining complete stability. The DJI Ronin-M also features three operating modes (underslung, upright and briefcase), so camera operators can always get the best shots without any additional set up. To precisely angle shots no matter how the operator moves, the DJI Ronin-M also features a two-operator mode allowing for a second operator to control camera movements while the first handles the DJI Ronin-M. The DJI Ronin-M connects via BlueTooth to the latest upgrade of the DJI Assistant app. By using the upgraded Auto Tune Stability (ATS) feature in the app, operators can enable precise, automated motor tuning. The recently-introduced Silent Mode in the app reduces motor noises for operating in quiet environments. Quick release system for the top handle allows users to mount the DJI Ronin-M easily to jibs, cranes, tripods, and many more. Solid, one-piece, magnesium camera-support frame provides extreme structural rigidity. DJI is exhibiting the Ronin-M as well as the recently announced DJI Phantom 3, the newest update in its iconic Phantom quadcopter line, at the National Association of Broadcasters (NAB) exhibition in Las Vegas this week at booth Central Hall C1707. A teaser trailer for a new short film shot exclusively on the Ronin-M in 7 hours was also launched today. The short film, “Lifted”, will launch online on Friday 17 April and stars Joel Edgerton. The Ronin-M will be available for pre-order by the end of the month, when the final pricing details will be released. For more details please visit DJI.com/Ronin-M.